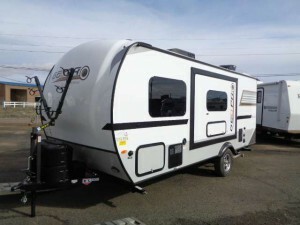 An important factor to consider when you’re in the market for an RV is to look at the weight. While purchasing a majority of the travel trailer warrants the purchase of a towing vehicle as well, it isn’t really necessary. There are ultra light travel trailers available in the market if you want to tow your camper with your current vehicle or just spend a decent amount in a towing vehicle that does the job. 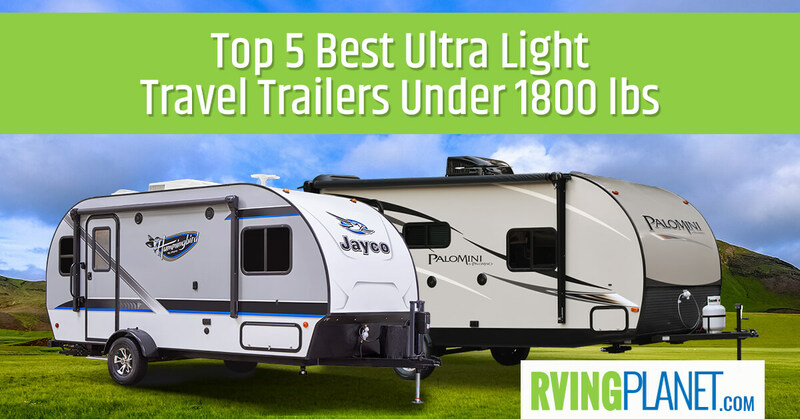 With that in mind, let’s take a look at the top 5 best ultra light travel trailers under 1800 lbs dry weight. 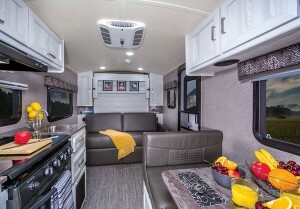 What puts an RV on the list: Apart from choosing the lightest towables in the market, we’ve also hand-picked the ones among that bunch which had good reviews among users and critics. Some of these even have more than one floorplan available, giving you some level of variety when you’re interested in one particular brand. 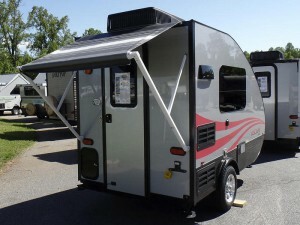 View All TAXA Outdoors TigerMoth Travel Trailer Floorplans! 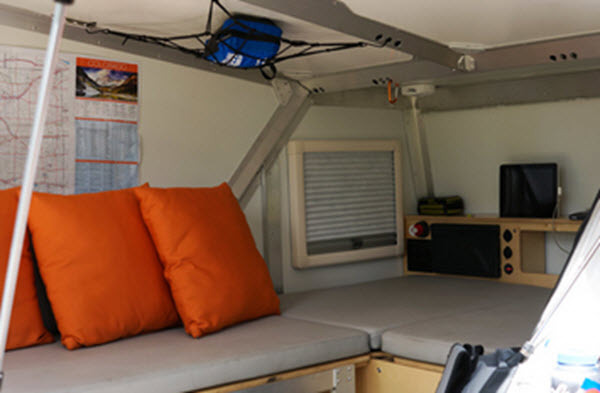 Why we recommend the TAXA Outdoors TigerMoth travel trailer: A single look at the specifications of the TigerMoth and its apparent that this camper is definitely one of a kind. It has 2 floorplans that are under 1800 lbs and also has an extremely positive rating: the TigerMoth Camp and the TigerMoth Trek. The Tigermoth serves as a perfect balance between tailgating and interior features. 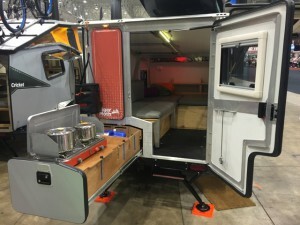 On the inside, it has LED lighting, USB charging ports and birchwood kitchen. On the outside, you have a grill, bike rack, solar heated shower among features and a decent set of options/upgrades too! 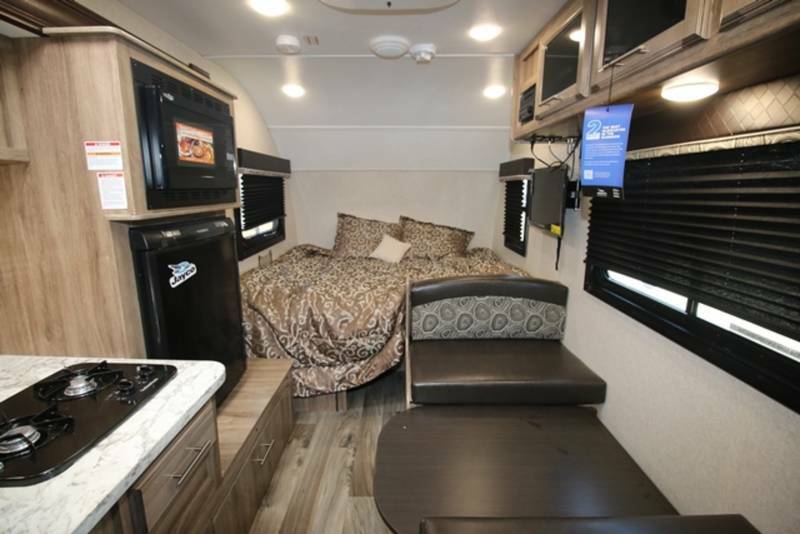 Some of those upgrades include but are not limited to a fully enclosed shower tent, a 5000 BTU window AC, mesh screen door for side and many others. 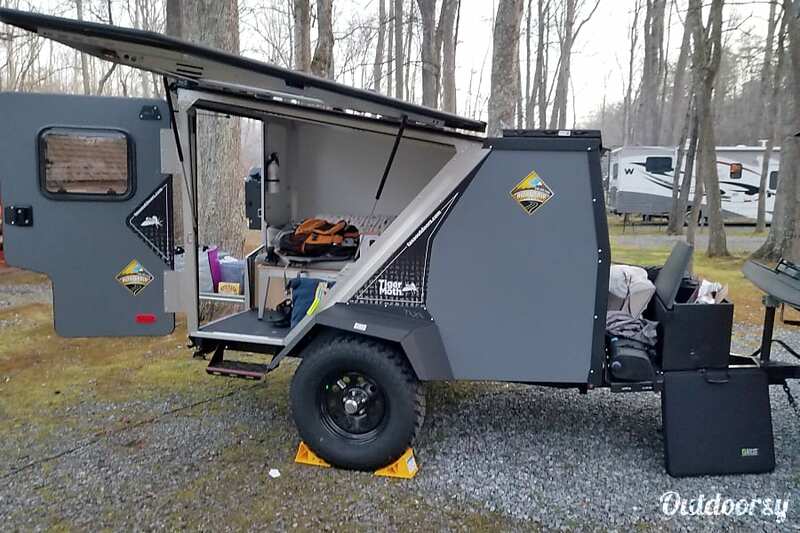 Why we recommend Forest River Rockwood Geo Pro travel trailer: Similar to the Tigermoth, Forest River’s Finest when it comes to ultra light travel trailers is the Rockwood Geo Pro, whose Rockwood Geo Pro 12RK floorplan goes as low as ~1100 pounds in dry weight. A bit more spacious and heavier floorplan is the Rockwood Geo Pro 12SRK, that weighs just shy of 1800 lbs and is 12 feet long. 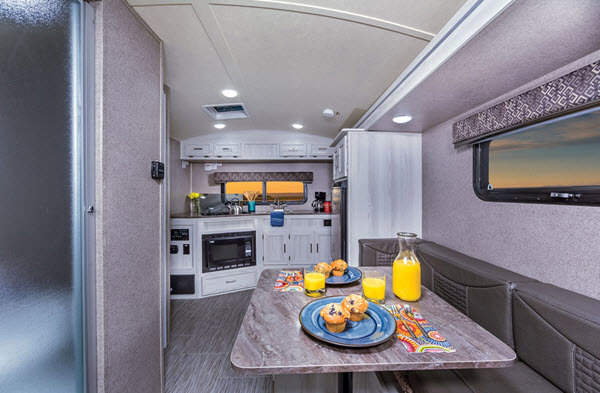 This cozy camper is also packed with features that you’ll find useful when camping, and even some luxury ones to make your trip comfortable. 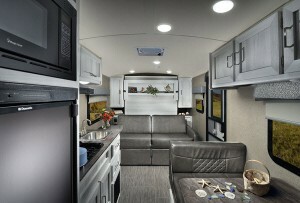 Some of those features include a stove and grill combo, Wi-Fi booster, power awning, 20,000 BTU furnace among others. They even have options to upgrade its capabilities such as a 13,500 BTU AC and a bike rack! 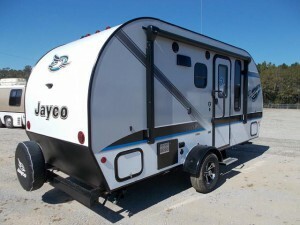 Why we recommend the Jayco Jay Hummingbird travel trailer: If you need a lightweight travel trailer but one that’s still spacious, it doesn’t get any better than the Hummingbird 10RK travel trailer from Jayco. This sole floorplan that comes under the criteria of being under 1800 lbs dry weight is easily a top choice for anyone looking for ultra light travel trailers. 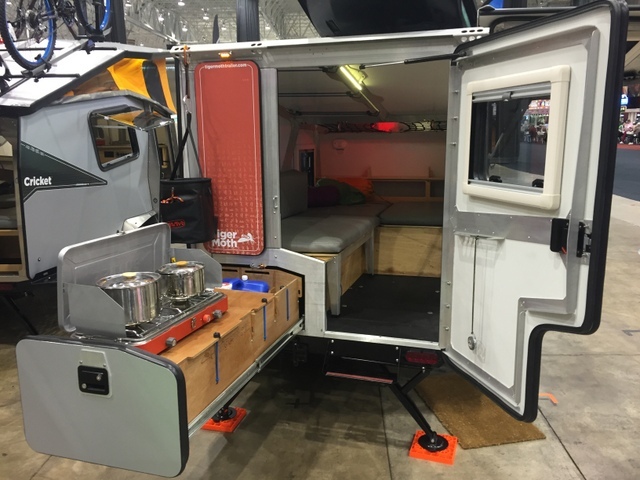 You’ll find this camper has quite a lot of features for tailgators. Exterior speakers, outside grill, exterior TV bracket and power awning are just some of the bells and whistles that it has. Further than that, it has a super comfy bed on the inside along with a picnic table and residential style countertops if you’re planning on spending the trip indoors. In short, Hummingbird has proved itself as a manufacturer of some of the best ultra light travel trailers in the market. 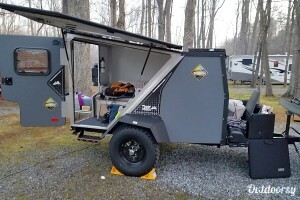 Why we recommend the Flagstaff E-Pro travel trailer: Akin to its Rockwood cousin, the Flagstaff E-Pro travel trailer by Forest River has an under 1800 lbs floorplan that’s so lightweight that it might as well be considered as a popup camper. The Flagstaff E-Pro 12RK is the one we’re talking about, that’s 11 feet long and sleeps 2 people. There’s a different set of features provided for the Flagstaff E-Pro 12RK and every other floorplan, but the common ones include outside speakers, Wi-Fi range booster, microwave oven and coleman stove/grill combo among many others. 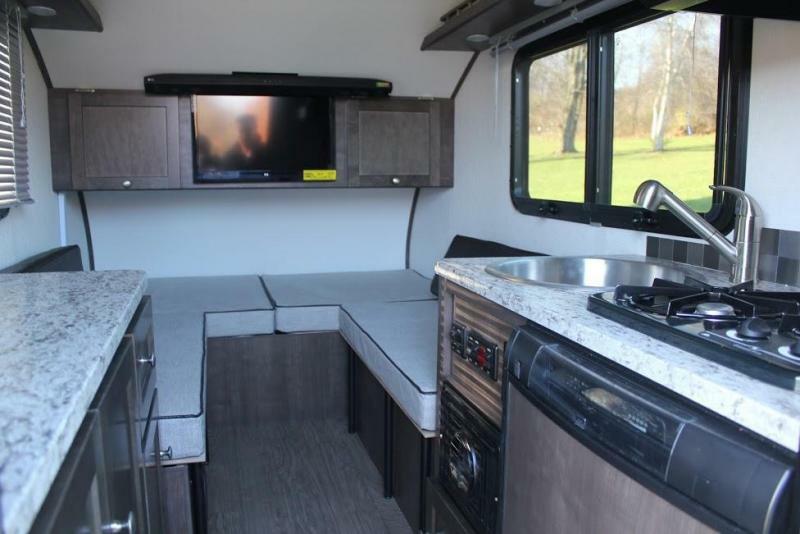 The aforementioned floorplan can also be made better by adding rack mounting bars, 13,500 BTU AC, a 22-inch TV with DVD player and a few others. 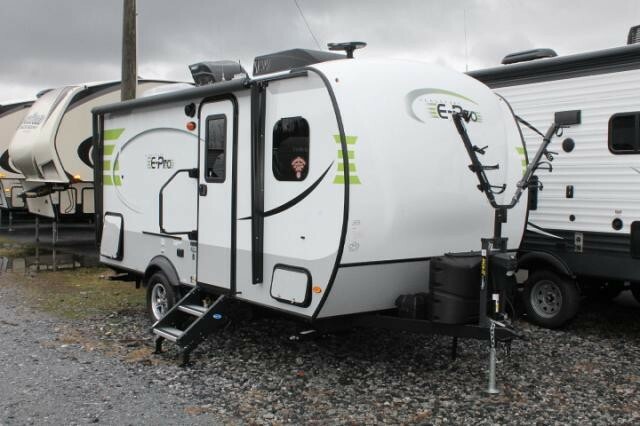 Hence, it goes without saying that you’re definitely picked the right choice if you prefer the Flagstaff E-Pro as your choice of a towable camper. 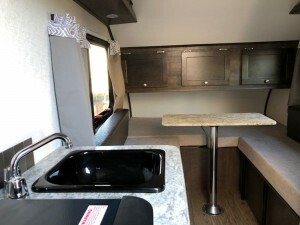 Why we recommend Aliner Ascape travel trailer: You probably know about the Aliner Ascape from our post of the top 5 travel trailers under 3,000 pounds. However, the Ascape, is much, much lighter than that. The Ascape MT itself is just 1170 lbs and spans 13 feet, making it quite spacious all things considered. Its other 4 floorplans such as the Ascape Camp are all under 1800 lbs dry weight as well. 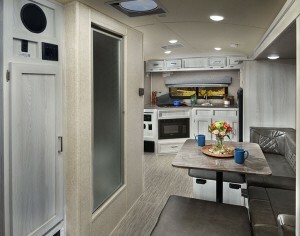 This Aliner camper is also just as feature-rich as any other regular travel trailer, which is a feat given its size. 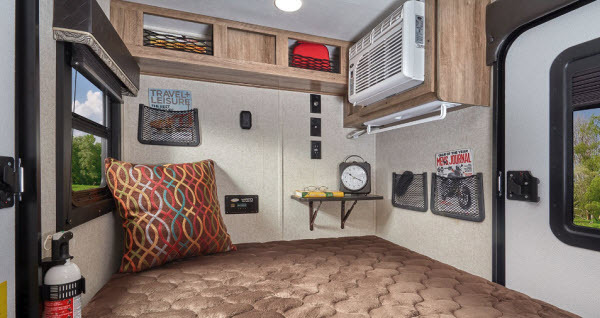 From a bluetooth sound bar and a 23-inch TV to 3-way refrigerator and attwood furnace, the Ascape delivers and exceeds every expectation from an ultra light travel trailer! Popup campers pose a lot of advantages, especially for someone heading into RVing for the very first time. Hopefully this list will provide a good starting point for you and let you know exactly what RVs have to offer without spending a ton of money right at the beginning. Share with us your favorite ultra light travel trailer under 1800 lbs in the comments below!